The melting point is the temperature at which the vapour pressure of the solid and the liquid are the same and the presssure totals one atmosphere. 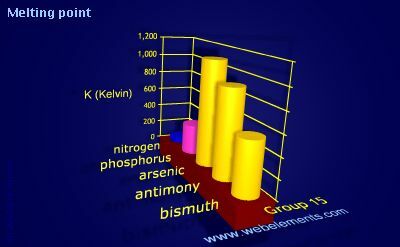 Image showing periodicity of melting point for group 15 chemical elements. On the Fahrenheit scale (°F), the melting point of water = 32°F while the boiling point = 212°F. You can look at visual representations of melting points, boiling points, and the liquid range using the following links.